In 1853, the 9 Sheikhdoms of the Gulf Coast signed a treaty with Britain, allying themselves to the world power. The 9 Sheikhdoms became known as the Trucial States. 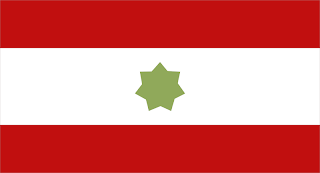 The unified flag for the States was a horizontal tricolour of red, white, and red. In the centre, a 7 pointed gold star. In 1873, the Trucial States became a British Protectorate. In the 1930's, oil was discovered, and a unity council was formed, however, in 1970, the Trucial States where broken up. Bahrain and Qatar broke away to be come independent, whilst the rest of them entered into a federation. And thus, the United Arab Emirates was born. 6 of the 7 Sheikhdoms, within the UAE, have their own flags. 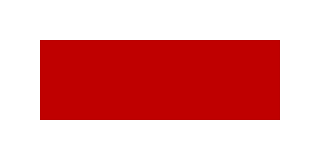 All using a combination of red, and white. Abu Dhabi is a red field, with a white square in the upper hoist canton. 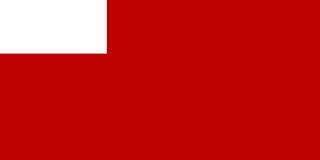 Ajman uses a red field also, but this time, with a white stripe running vertically up the hoist of the flag. Dubai also uses a red field, with a white stripe running vertically up the hoist, but it is a slightly thicker stripe than Ajman. Both Sharjah, and Ras al-Khaimah use the same banner. A red field, with a white border round it. 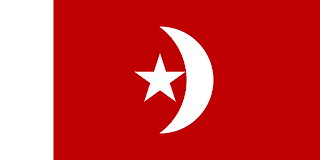 Umm al-Qaiwain uses a flag similar to Dubai, except that it places a white crescent facing the hoist, and a white 5 pointed star. Fujairah uses the same flag as the UAE. 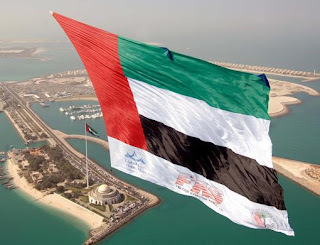 The flag of the United Arab Emirates was formally adopted on December 2, 1971. It uses the pan Arab colours of red, white, green, and black. The flag itself is arranged as a horizontal tricolour, with the colours of green, white, and black. A 4th bar of red runs vertically along the hoist of the flag. Green stands for fertility, white stands for neutrality, black stands for the nations oil wealth, and the red stands for the unity of the 7 Sheikhdoms.